I consider myself fortunate to call Ontario home sweet home. I spent my youth growing up just outside of Toronto and was the youngest member of an adventurous family keen on road tripping to Muskoka’s pristine lakes, Ottawa’s world class museums and Stratford’s celebrated theatre festival. 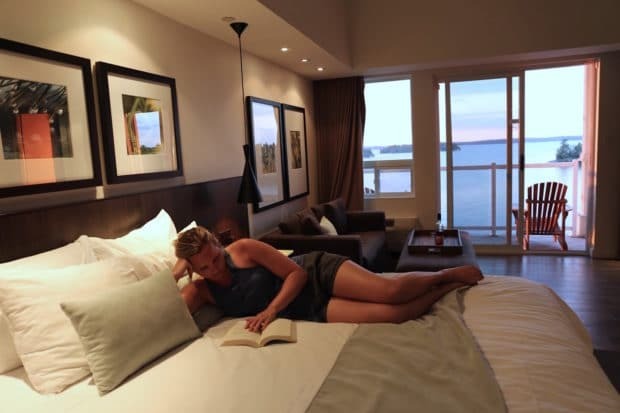 There’s nothing quite like exploring your own backyard, and what better way to skip through Ontario’s top destinations then by resting and relaxing at one of the province’s finest luxury boutique hotels? It’s at these petite palaces where guests are greeted by the creme de la creme in customer service, sleep tight in sweet suites and indulge in award winning fine feasts. Make a point of romping around Ontario’s beautiful backroads and you’ll find her charming communities quickly steal your heart! At the Windsor Arms, historic and new-millennium amenities are fused together to create a delicate balance of old-world charm and modern decadence. Located in Toronto’s fancy-pants Yorkville neighbourhood, the building dates back to 1927 when the University of Toronto, with its neo-Gothic buildings and distinctive piers, porches, and crests were architectural marvels of the burgeoning metropolis. Back in the 30s the original idea was to create a hotel residence to blend in with the university’s signature, Victorian buildings. Nowadays, the Windsor Arms Hotel plays home to visiting A-listers, big-ticket musicians and prestigious jet-setters. Did you know Elizabeth Taylor once got engaged to Richard Burton here? Other notable past guests include Sandra Bullock, Johnny Depp, Edward Norton, Demi Moore, Clint Eastwood, Jessica Lange and Sean Penn. The hotel features 28 perfectly appointed suits all of which were designed by the hotels owner George Friedmann. 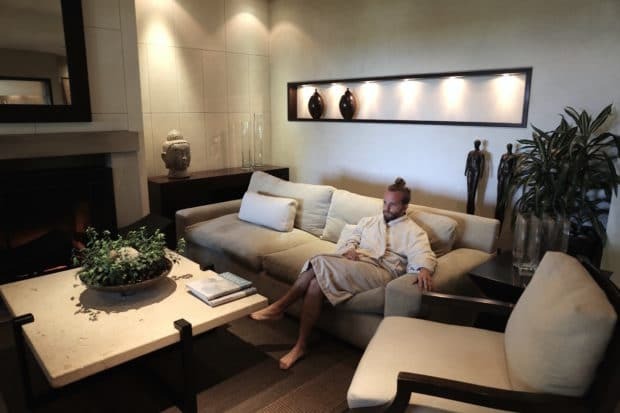 I enjoyed a much needed staycation in the hotels 700 sq ft Deluxe Suite which features unique butler’s pantry, oversized bathroom with limestone floors, comfy living room, state of the art sound system, Nespresso maker and Molton Brown amenities. 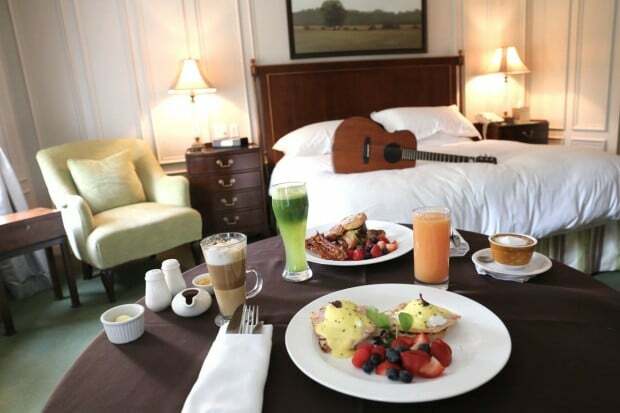 Each suite also features a musical instrument for guests to enjoy and include baby grand piano, harp and guitar. 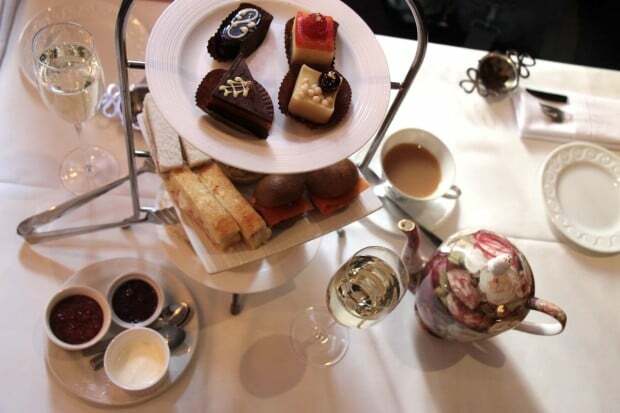 Since 1927, High Tea at the Windsor Arms has been synonymous with elegant, afternoon indulgence. The hotel offers plenty of nooks for sipping loose leaf: French-style lobby tea room, majestic purple room with original working fireplace or behind velvet drapes in the romantic Russian Red Tea Room. Enjoy a flute of sparkling wine or a glass of sherry as you settle into your plush seat or comfy sofa. Indulge in dainty sandwiches featuring the likes of Gougere Chicken Terrine and Guacamole, or choose from such delicacies as goat cheese and caramelized shallot tart. Finally, give into a seductive selection of pastries and sweets, each exquisitely hand-crafted in the kitchen. Located just a short road trip away from Toronto, Relais & Chateaux Langdon Hall is Ontario’s poshest petite palace. In recent years the property has garnered a long list of swoon-worthy accolades, placing her in the choir with Canada’s creme de la creme. No doubt about it, she’s Ontario’s best kept secret! 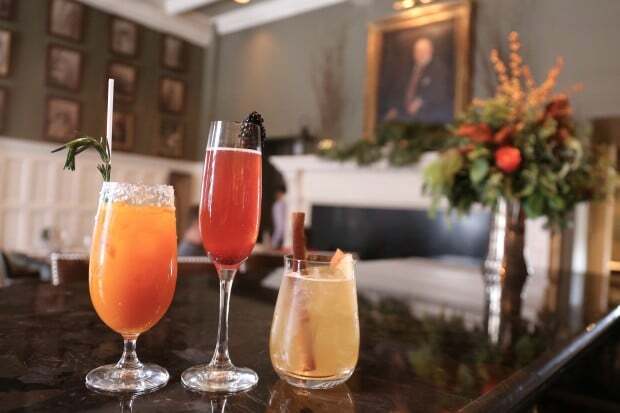 My favourite place to rest and relax in Langdon Hall’s manor house is Wilk’s Bar. The cozy space features blazing wood burning fireplace which perfumes a room filled with comfortable chairs and time period photos of Langdon Hall’s original founding family. The hotel’s culinary mantra is to use local, seasonal ingredients whenever possible, many of which are plucked from the hotel’s gardens and greenhouse or foraged deep into the woods. The mixologists here really have fun with fluids, steeping spirits with foraged bark, fragrant herbs and bright berries. Recently, Sommelier Faye and Gardiner Mario worked together to create a seasonal barrel aged cocktail, which was a complete blend of bourbon, apples, grapes, ginger root and a variety of herbs. Nestled in the heart of the historic town of Niagara-on-the-Lake, The Oban Inn is a timeless property officially designated as a significant heritage resource. Niagara on the Lake’s first and original country Inn overlooks Lake Ontario and the oldest golf course in Canada. This landmark property was built as a private home in 1824 by Captain Duncan Milloy of Oban, Scotland. For the love of friends and food, Captain Milloy opened his home to all his guests. Fine hospitality began at The Oban Inn and guests from all over the world return generation after generation. A devastating fire on Christmas Day 1992 completely destroyed the Inn leaving only the foundation. Re-created as an exact replica of the former Inn, The Oban Inn again opened its doors in November 1993, proudly welcoming guests back to its grace and understated charm. Today, The Oban Inn features 26 luxurious guest rooms, a gastronomic restaurant surrounded by pond and lush English gardens, a state-of-the-art fitness studio and thirst quenching outdoor swimming pool. If you’re looking to treat yourself to a little rest and relaxation spend your morning loitering in luxury at OSpa. The Oban Inn’s tranquil, personalized, full-service spa is a unique facility dedicated to the health, well-being and vitality of each guest where the philosophy and décor are in harmony, forming a peaceful mood of sun, moon, earth and water. The spa offers four treatment rooms where friendly therapists use Aveda products to nourish the body and inspire the soul. 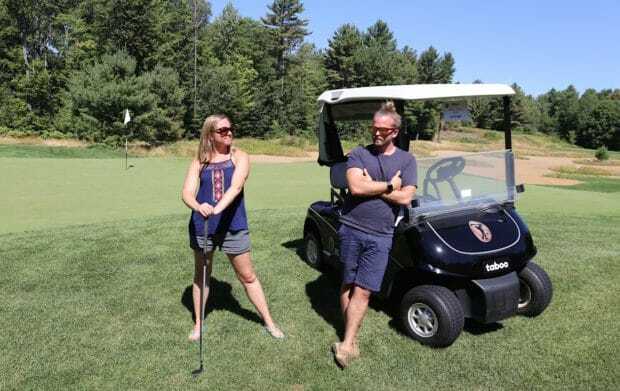 Taboo Muskoka has been welcoming guests to the shores of Lake Muskoka since 1926, first as the Muskoka Beach Inn, when guests mainly arrived by horse and buggy from the Gravenhurst railway station. The property was reimagined in 1959 as the Muskoka Sands, and more recently in 1985 as the Taboo we know today. The luxurious lakeside resort features 59 spacious suites and 93 condos designed in a modernist style by Anna Simone. Our 440 sq ft suite included a plush king bed, booming gas fireplace, elegant bathroom outfitted with amenities by Hydro Spa and a balcony where two adirondack chairs offered the perfect perch each evening to sit back and relax as Muskoka’s legendary summer sunset splashed across the sky. Oenophile’s looking for a rural romp in Ontario are arriving in droves to Prince Edward County. Located between Toronto and Kingston (just south of Belleville), Prince Edward County is booming as innovative wine makers, brewers, distillers, chefs, artisans and innkeepers have transformed a once sleepy agricultural landscape into a deliciously vibrant cultural community. Design lovers smitten for that antique meets contemporary vibe will find Nirvana at Angeline’s Inn in Bloomfield. 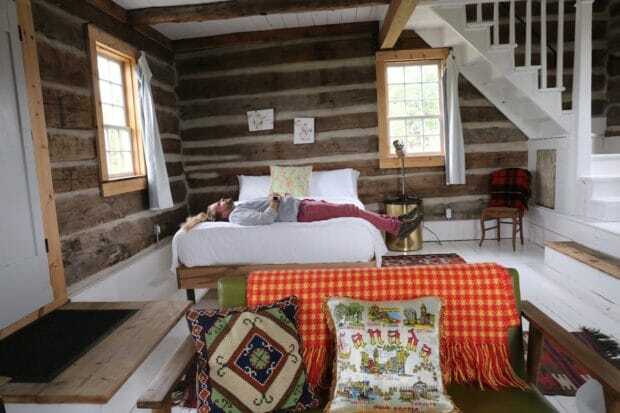 Considered one of The County’s ritziest retreats, the small family run Inn has been in business for over 27 years and features 17 stylish rooms, lovingly curated by innkeeper Alex Fida. The centrepiece of the property is a Victorian mansion built in 1869 but our favourite place to rest our head is tucked behind a wee garden out back. The Babylon is an absolute dream for couples looking to enjoy a quiet weekend retreat or romantic honeymoon getaway. The abandoned log cabin which dates back to the 1860s was catalogued, moved 33 km and rebuilt into the ultimate homage to Canadiana. The jaw-dropping cabin features a loft bedroom with king size bed, queen size bed on the main floor which overlooks an intimate living room, booming fireplace, spacious dining room, gorgeous kitchen which overlooks a farmers field, sun-soaked patio and bathroom outfitted with soaker tub and rain shower. After spending a weekend sloshing and sipping in The County you’ll find it painfully challenging to head back to the city after living like a King in your own cute cottage. One of The County’s hippest haunts for the hungry can be found on the main floor of Angeline’s Inn. 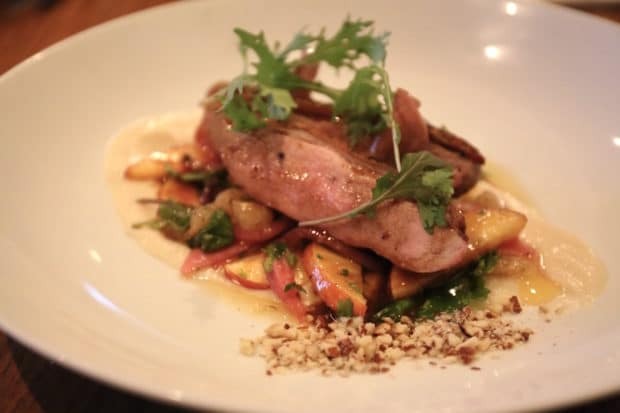 The Hubb Eatery pays homage to the original builders of the house, Angeline and Henry Hubbs, and today is a hub of social activity for visiting tastemakers and in-the-know locals. Chef Elliot regularly switches up his menu to reflect each seasons bounty while partner in crime Laura curates an impressive wine list featuring the best bottles from the region. Highlights from our fresh feast at The Hubb include house smoked trout tacos, hearty fromage and charcuterie board, an exceptional Parisienne gnocchi (proving once again vegetarian options can shine bright in a bowl), crispy duck breast paired with sweet Ontario peaches and petite Cornbread Berry Cobbler which arrived at the table frothing with creamy mascarpone.